Catalan police have identified the five terrorists who were shot dead in Cambrils. Authorities say the Barcelona and Cambrils attacks, which left 14 people dead and some 130 others injured, was their plan B after a bombing plot was disrupted by the explosion in Alcanar. “We have already identified 5 people shot down in Cambrils. On the other hand there are 4 people arrested and 3 more identified,” Catalonia’s police tweeted. All five of the alleged terrorists are Moroccans. The list of dead suspects includes Omar Hychami, 21, born in Morocco; 19-year-old Moroccans Houssaine Abouyaaqoub and Said Aallaa; Mohamed Hychami, 24, born in Morocco and Moussa Oukabir, 17, according to Europa Press. Police are still searching for Younes Abouyaaqoub, 22, who has not been ruled out as possibly being the van driver in Barcelona. Earlier, Spanish media outlets, citing police sources, reported that the alleged van driver of the Barcelona attack, named as Moussa Oukabir, was among those shot and killed in Cambrils later. Authorities, however, are yet to confirm that information, as they believe the driver might still be on the run. Investigators believe the attacks in Barcelona and Cambrils were organized by a cell of at least 12 terrorists. Five of them were killed in Cambrils and four others detained. Authorities have also identified three others – two of whom could have died in Alcanar, something they are still investigating. 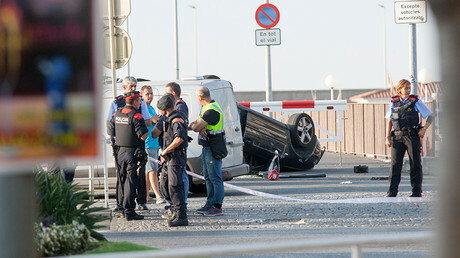 Authorities have yet to identify the driver of the van in the Barcelona attack, Catalan regional police official Josep Lluis Trapero said during a news conference Friday, noting that Wednesday's Alcanar explosion, the Barcelona ramming and the Cambrils attacks are all connected. “We work with the hypothesis that the suspects were preparing both attacks for some time in this building of Alcanar. It was a group, we do not know the specific number, but we do not rule out having other attacks in mind. They are all identified,” he said. On Thursday afternoon a van plowed into pedestrians on a popular tourist street in Barcelona, killing 13 people and injuring more than 100 others. Hours later, terrorists launched a second attack in the seaside town of Cambrils, injuring seven people, one of whom later died. Authorities believe the two attacks in Barcelona and Cambrils are directly linked to Wednesday night's explosion in Alcanar where police discovered at least 20 gas containers. Investigators believe the house, which was destroyed in the blast, served as a safe house for a terrorist network, and that an accidental explosion prevented the suspects from carrying out a much bigger attack. "The Alcanar blast triggered the attacks... It's not what they had in mind initially," Trapero said, according to Reuters. "The blast has prevented a larger bombing from happening."